Many wearers find the comfort of their dress shoes will far outlast their appearance. Without proper care and light maintenance, your shoes will eventually crease, crack, and mar. Shoes which use very soft leather or soft synthetics are the most susceptible to creasing, yet even they can be kept in good condition with just a little care. Here we’ll show you exactly how to stop your dress shoes from creasing. 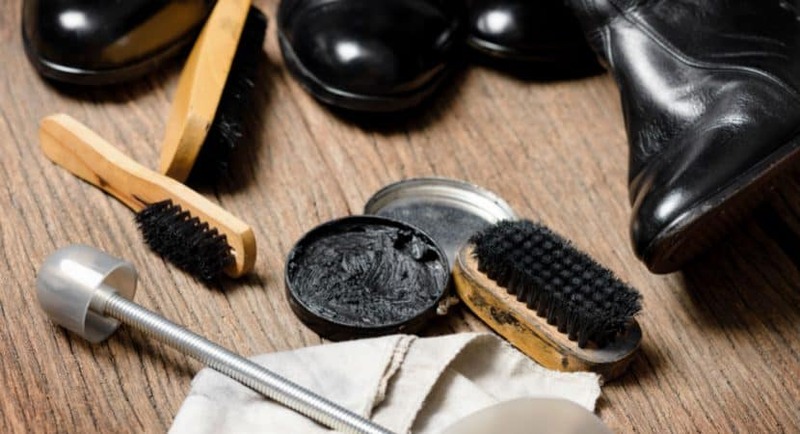 A minimal amount of effort will keep them looking as good as new. Leather will eventually crease; there’s no stopping it. One can, however, prolong the process and uphold the “new” appearance of a pair of shoes by taking good care of them and picking a shoe that fits well. The majority of creases arise from poorly fitting shoes. A perfect fit will eventually crease regardless of quality. Carrying more weight as to whether or not your dress shoes will crease is the individual design of the shoe itself. The quality of leather rarely has an effect on the prominence of creases and how quickly they arise. As a general rule-of-thumb, plain toed whole-cut shoes are the most likely to show prominent creases. Semi capped toe brogues are a good midway choice when it comes to not displaying marring creases, with full capped toe brogues being the best. Wholecut leather shoes take more tension from the foot as there are no sections to distribute pressure; therefore, creases form quicker and are more noticeable. A brogue generally has four to five sections joined to comprise the total design of the shoe, giving more areas for tension to be disbursed, thus, less creasing. Here are a few great ways to keep your leather or leather-and-material dress shoes in tip-top condition, without needing to spend a fortune. A good pair of dress shoes will last for many years without creasing or cracking if you make sure to carry out the following maintenance techniques and crease removal solutions. The upper of your shoe should always be as high a quality as possible. The longer the upper holds the form of your foot, the better the bit. This leaves less space for prominent creasing to occur. You will notice that the faster your upper degrades and wears down, the more rapid the appearance of creases. Selecting the correct upper is determined almost entirely by the dimensions of your foot. Be sure to choose a design which appears appropriate for the breadth and incline of your foot-to-ankle. Cedarwood stumps are readily available to insert into your shoes when not in use. Within roughly two months of use, the leather will be retrained to its original shape, smoothing out all creases. This solution also comes with the added benefit of eliminating odors thanks to the antimicrobial nature of cedarwood, whilst actively absorbing any moisture which may be latent in your shoe. If you can’t find or can’t afford cedarwood, any log which tightly fits the shoe will suffice. A scalding hot iron can damage leather so take extra care when using this technique. Heat your iron to a moderate temperature of between 60 and 80 degrees Fahrenheit. Cover your shoe with a damp cloth and then iron on top of it to reshape the form of the leather. As the creases are ironed out it is highly recommended that you place your shoe on a shoe tree so that your leather adapts and strengthens the new form to memory. Many creases form from the stress placed on the leather originating at the heel when fitting a shoe. The pressure can even cause cracking over time, making a shoe horn invaluable to preserving leather and other synthetic materials. A shoe tree is an upgrade on a shoe horn which is adjustable to fill the whole of your shoe, thus creating tension upon the leather or synthetic which smooths out creases, returning it to its original contours. A variety of shoe trees are available ranging from cheap spring shoe trees without a whole heel, to mechanical advanced plastic shoe trees which feature adjustable stem pieces. They are extremely effective, with even a basic shoe tree working wonders to prolong the formation of creases. However, if you don’t have one handy, proceed to newspaper and a wet cloth, as detailed next. If you notice any slight creases forming, then clean the dirt off with a mild detergent and water. Don’t wet the shoes too much, but get most of the dirt off. Gather and scrunch up a bunch of paper or fabric and force them into your shoe. Make sure to really cram the paper in, causing the shoe to expand to its original shape. Proceed to lay a wet cloth over each shoe, pressing down the fabric so that it molds to the contours of the shoe. All you need to do then is steam iron your pair of shoes and your creases will be a thing of the past. Keeping just two of the same type of shoe will allow you to effectively rotate them, keeping both in a far better condition than if worn on a day to day basis. All shoes should rest for at least 24 hours after use to allow them to dry out and air, reducing the rate at which prominent creases will form. If at all possible, be sure to fit your shoe with a shoe tree while not in use to guarantee that the shoe will sustain its appearance for a long to come. Regardless of the cost of your dress shoes, each pair requires light maintenance to ensure good longevity and a stylish, crease-free appearance. All shoes will eventually crease, but if you implement the advice listed above you can rest assured that any creases which do form, will not be prominent. Even inexpensive shoes can withstand the test of time, given a little care.